Everything you need to drive quality referrals, all for one small monthly fee. Mobile/tablet visitors are quickly overtaking desktop traffic, and not one screen size currently has more than a 20% market share. Medibrite websites are optimized for all devices and resolutions to ensure that no key audience is limited. 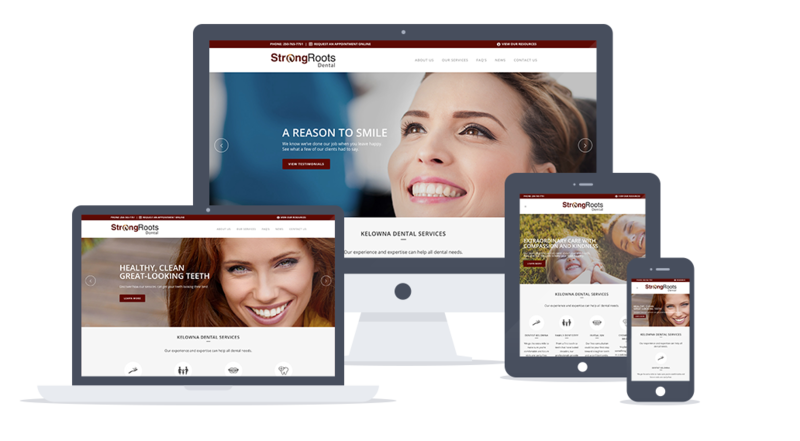 Health, medical, and dental website design done right. Our campaigns target people in your area who are actively searching for the services and treatments that you provide. We only provide targeted marketing campaigns to one clinic per city (per industry) so that you can get an edge on your competition. Online leads generated from a targeted marketing campaign for Okanagan Skin Care Centre in Kelowna, British Columbia. Real data shows the first 4 months growth in the campaign. Websites built with all devices in mind to ensure you’re not limiting a key audience. Beautiful websites focused on lead generation to help you grow your practice. Your ROI matters, and we deliver results that you can measure against your investment. Interactive before & after galleries that are sure to impress, and work great across all devices. ARE YOU READY TO GET STARTED WITH MEDIBRITE? Have one of our Sales Representatives take you through an existing client’s website so you can understand our offering with ease. Learn how we can help your business generate more leads and improve your online brand.